As it says in the good book, thou shalt not covet they neighbors wings. 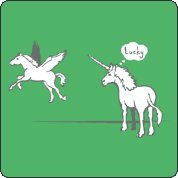 In the unicorn’s defense that flying stuff is pretty cool and a winged horse is lucky indeed. Of course, if the unicorn takes a step back and realizes all that he has: mystical powers to turn spring water into Gatorade, the finest oragami skills, etc., then, unicorn can be content. Plus, he’s adored by 98% of all pre-pubescent girls, and Pau Gasol. Get this lucky unicorn tshirt and revel in the spectrum of emotions this tshirt conjures.